The original palace built of wood, got burnt down in 1897, during the wedding of Jayalakshammanni, the eldest daughter of Chamaraja Wodeyar and was rebuilt in 1912 at the cost of Rs. 42 lakhs. The present Palace built in Indo-Saracenic style and blends together Hindu, Muslim, Rajput and Gothic styles of architecture. It is a three-storied stone structure, with marble domes and a 145 ft five-storied tower. Above the central arch is an impressive sculpture of Gajalakshmi, the goddess of wealth, prosperity, good luck and abundance with her elephants. The palace is surrounded by a large garden. Designed by the well-known British architect, Henry Irwin. The palace is a treasure house of exquisite carvings and works of art from all over the world. Mysore Palace is priceless national treasure and the pride of a kingdom, the Mysore Maharaja Palace is the seat of the famed Wodeyar Maharaja's of Mysore. Mysore Palace Board has launched a facility which provides exclusive illumination of the palace for 30 minutes at a price tag of Rs.50,000. Foreign Tourist Rs.200/- Free Entry to children up-to Age of Ten. Tickets can be bought at the entrance of the Mysore Palace. 07.00 pm - 08.00 pm. Only on Sundays, National Holidays and State Festivals.During the Dasara Festival Mysore Palace is illuminated between 7 p.m. to 9 p.m.
Mysore Palace is in the heart of Mysore city. The Jaganmohan Palace was built during rule of Krishnaraja Wodeyar III in 1861, as an alternate retreat for the royal family. The Mysore Palace, which was the original home of the royal family, was burnt down in a fire and the construction of a new palace in its place was started in the year 1897. 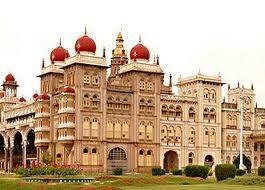 The Royal family lived in this palace till the construction of the new Amba Vilas Mysore Palace in 1912. The installation of Krishnaraja Wodeyar IV took place in a pavilion inside the Jaganmohan Palace in 1902. 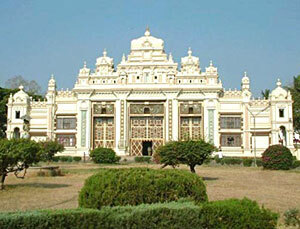 The early convocations of the Mysore University were also held in this palace. The first session of the Legislative Council of the Mysore state was held here in July 1907. The Legislative Council was then called as the Representative Council and was presided over by the Diwan. Located in the heart of the Mysore city. The Brindavan Gardens is a show garden that has a botanical park with fountains as well as boat rides beneath the dam. Diwans of Mysore planned and built the gardens in connection with the construction of the dam. 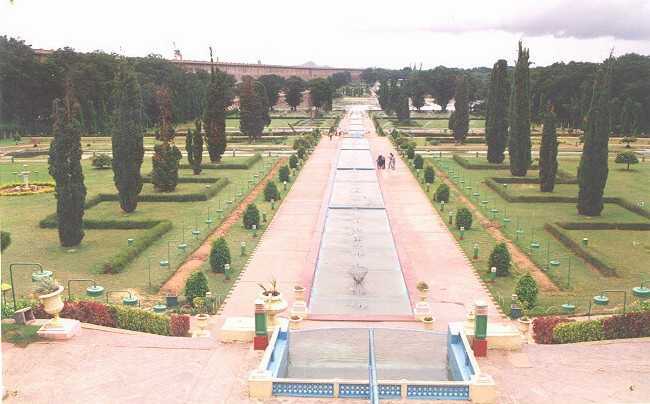 The work on laying out Mysore Brindavan garden was started in the year 1927 and completed in 1932. The garden is laid out in 3 terraces which contain water fountains, Ficus trees, foliage plants such as Duranta plumaria and Euphorbia and flowering plants like Celosia, Marigold and bougainvillea. The main attraction of the Brindavan Garden is the Musical Fountain ( Dancing Fountains ) in which bursts of water are synchronized to the music of songs. The musical fountains have a harmonic blend of water, colors and music. The Brindavan Gardens here is the best illuminated terrace garden in India. The Krishna Raja Sagara(KRS) dam was built across river Kaveri the life giving river for the Mysore and Mandya districts in 1924. Apart from being the main source of water for irrigation in the most fertile Mysore and Mandya, the reservoir is the main source of drinking water for all of Mysore city and almost the whole of Bangalore city, the capital of the state of Karnataka. 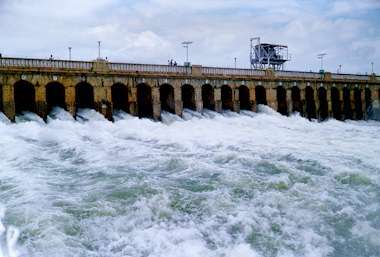 The water released from this dam is further used as an important source of water in the state of TamilNadu, which has its own Mettur dam in the Mettur district. Sir. Mokshagundam Visvesvarayya served as the chief engineer during the construction of this dam. The dam is named for the then ruler of the Mysore Kingdom, Krishnaraja Wodeyar. The KRS dam is a civil engineering wonder and the garden is one of the major attractions near the city of Mysore, this engineering marvel is spread over 150 acres of land and provides irrigation to more than 1,20,000 acres. Distance From Mysore 24 kms. Karanji Lake is a picturesque lake located at the footsteps of Chamundi Hills and behind Mysore Zoo. Karanji means 'fountain' in Kannada. Spread over an area of 90 acres, it is regarded as one of the biggest lakes in Karnataka. Karanji Lake is home to more than 90 species of resident and migratory birds. It also supports several species of butterflies, small mammals and is a good example of wetland ecosystem. 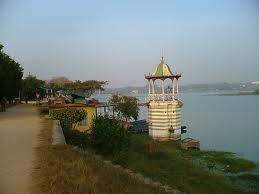 Karanji Lake was built by the King of Mysore about 100 years back, as a percolation tank. This lake was used by the residents for bathing, washing, drinking etc. The Mysore Zoo took over the lake in 1976. The 90 acres water spread area has a 2.5 Kms. long feeder channel from the nearby Chamundi hills and has about 745 hectares of catchment area. Karanji Lake also includes children corner and boating facilities. The high observation tower gives a grand view of greenery stretching all around. Karanji lake is owned and maintained by the Mysore Zoo Authority. Sri Ranganatha Temple is dedicated to Lord Ranganathaswamy an incarnation of Lord Vishnu. Part of the famed Pancharanga Shetrams, the Sri Ranganatha Temple is located on the banks of the river Cauvery in the historical town of Srirangapatna. A remarkable fact about this temple is that Hyder Ali and Tipu Sultan, two of the great Muslim kings of India were Lord Ranganatha's devotees! This temple looks magnificent during the festival of Makar Sankranti, lit up with a hundred thousand lamps. The temple of Sri Ranganatha in Srirangapatna was built in 894 AD by Ganga King Tirumalaiya. Several dynasties of Kings were its patrons and have helped in its upkeep over the years. Prominent among these royal patrons were the Vijayanagara Kings, Hoysalas, Hyder Ali, Tipu Sultan and Wodeyars of Mysore. 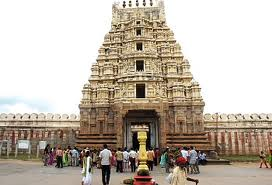 Sri Ranganathaswamy Temple in Srirangapatna is one of the most important Vaishnavite shrines in South India. The architecture of Sri Renganathaswamy Temple follows the style of Hoysalas and Vijaynagara Empire. The main entrance is beautifully engraved with 24 forms of Lord Vishnu. There is a sculpture of a couple of well ornamented and majestic elephants standing guard at the entrance. As you enter the queue to get into the main temple, two masterpieces not to be missed are a Gold Plated Garudavahana and Nagashesha. The presiding deity Lord Ranganathaswamy is seen sleeping on Adi Sheshan the 7 headed serpent. The Goddess is Ranganayaki. The temple also enshrines the images of River Cauvery and Sage Gautama. The temple has several other deities including that of Lord Venkateshwara, Narasimha and Panchamukha Anjenaya. Chamundi Hills can be viewed from a distance of about 8 to 10 kms and from all the corners of Mysore City. 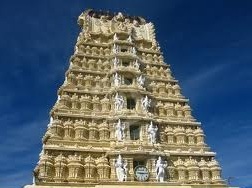 Chamundeshwari temple is situated on the top of Chamundi hill which is about 3,489 ft. above sea level and located at a distance of 13 kms from Mysore. The temple is dedicated to Sri Chamundeshwari, the titular deity of the Mysore Royal Family also described as Mahishasura Mardini for having killed the buffalo headed demon Mahishasura. The temple has a very beautiful idol of the goddess wearing a garland of skulls. Goddess Chamundeshwari, also spelled Chamundeswari is an incarnation of Goddess Durga, Goddess Kali is also referred to as the Goddess Chamundi. The Chamundi temple has always been patronised by the rulers of Mysore. In 1659 Dodda Devaraja Wodeyar built 1,000 steps and huge Nandi, Lord Shiva's Bull. This colossal Nandi is one of the largest in India, 16 ft. (4.8 meters) tall at the front and 25 ft. (7.5 meters) in length. The magnificent pendent bells around its neck are exquisite. Nandi and the temple beside it are located at the 700th step of the Chamundi Hill. Krishnaraja Wodeyar III repaired the shrine in 1827 and built the present beautiful forty-meter seven storied Gopura (tower at the entrance) with gold finials and set up statues of his and his three queens. In 1827, Krishnaraja Wodeyar III made arrangements for festivals and processions and gifted Simhavahana in 1843. There are two other temples dedicated to Lakshmi Narayana Swamy and Mahabaleswara. Sri Mahabaleswara temple - dedicated to Lord Shiva in the form of Linga is the oldest temple on the hill. It was built before the beginning of the Hoysala rule. Epigraphical evidences indicate this area as Mabhala or Mabbala theertha and states that Hoysala King Vishnuvardhana has given donations to this temple in 1128 A.D. 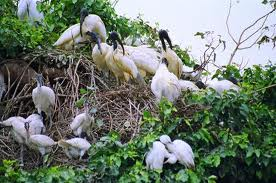 The Ranganathittu Bird Sanctuary is situated at 4 Kms from Srirangapatna and 19 Kms from Mysore. The Bird Sanctuary is named after Sri Ranganatha Swamy, an incarnation of Hindu God Vishnu. 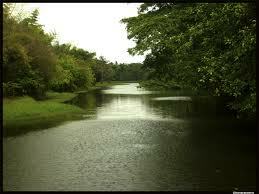 It is an island on the river Cauvery and it is spread on an area of 40 acres. The Sanctuary includes six islands and was declared a bird sanctuary in 1940. The islands host numerous mammals and migratory birds. Some of them are Bonnet Macaque, colonies of Flying Fox and common small mammals like Indian Gray Mongoose, the monitor lizard and Civet. The Marsh Crocodile also called the Mugger Crocodile is a common inhabitant of the riverine reed beds. Migratory water birds include Painted Stork, Asian Open bill Stork, Common Spoonbill, Woolly-necked Stork, Black-headed Ibis, White Ibis, Lesser Whistling Duck, Indian Shag, Stork-billed Kingfisher and other common birds like egrets, cormorants, Oriental Darter, and herons. The Great Stone Plover and River Tern also nest here. It is home to a large flock of Streak-throated Swallows. From Mysore 19 Kms. Srirangapatna 4 Kms. Mysore Zoo or Shri Chamarajendra Zoological Gardens is one of the oldest zoo in India. It is home to a wide range of wild species and takes the credit for alluring vast number of visitors with its rich breed of flora and fauna. Mysore Zoo is a must in the itinerary for sightseeing in Mysore. Mysore Zoo is a pleasant experience also because most animals are kept in well spaced enclosures and it's a delight to see them move around freely. The Mysore zoo abounds in natural vegetation cover and comprises of various rare species of plants & trees that are hard to find some where else. It is located inside the city unlike many other Zoos in India and Mysore Zoo is considered to be one of the best and oldest in the world. The Mysore zoo is over a century old and has an interesting history of its own. Sri Chamarajendra Wodeyar had a vision to create a well laid-out city amidst the gardens and founded the world famous Mysore Zoo in the year of 1892. The Mysore Zoo which has now spread over an area of 250 acres was initially meant for the exclusive visit of the royal family but public entry started as early as 1920. After India attained freedom, the Zoo was presented by the then Maharaja to the Department of Parks and Gardens of the Mysore State Government. 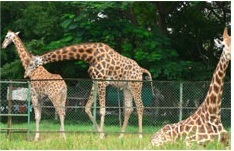 Mysore zoo is situated in the heart of Mysore city. It's about 3 kms. from city bus stand and 2 kms from Mysore Palace. St.Philomena's Church was built in 1956 and is one of the largest churches in the country. The illuminated church in the evening is a wonderful site not to be missed. 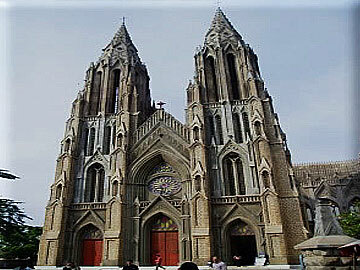 St. Philomena's Cathedral is among the most majestic churches in India. Drawing inspiration from Germany's Cologne Cathedral, this colossal church built in the neo-Gothic style. The St. Philomena's Church in Mysore is one of the oldest churches in India. It is over 200 years old. Initially over 250 years ago there was a small church in its place. Maharaja Krishnaraja Wodeyar IV laid the foundation of the new church on October 28th, 1933 that was to be built in the place of the small church built by his grandfather. A Frenchman named Daly designed the church. The floor plan of the cathedral is in the form of a cross. 110 upto five light circle, from there walkable distance. Kukkarahalli Lake is spread over 58 hectares with a shoreline of roughly five kilometers in Manasagangothri, the sprawling campus of the University of Mysore. Mummadi Krishnaraja Wodeyar was responsible for getting the lake created, in the year 1864, to provide water for irrigation to about 10,000 acres of land outside the city. Reckoned to be a jewel in the crown of Mysore, the picturesque lake, which inspired poet laureate Kuvempu to pen many of his works, provides the much-needed lung-space to the city. This lake is home to more than 180 species of birds, some of them aquatic. During the migratory season the lake plays host to a variety of winged visitors, some from as far as Siberia. The views from the north shore is particularly attractive with the lake and its surrounding trees, the spire of the Deputy Commissioner's offices rising above them and the low rise of the Chamundi Hill in the background. The birds found in the lake are Spot-billed Pelicans, Little Cormorant, Painted Storks, Open-bill Storks, Eurasian Spoonbills, Black-crowned Night Herons and Oriental Darters.